eziFunerals is pleased to announce the release of its latest video to help consumers plan a funeral online. Whether you are planning a funeral for yourself or for a loved one, our latest funeral planning video can help you learn more about our innovative platform. You’ll find out how to create a basic funeral plan in just minutes, and how you can connect with funeral directors in your area. 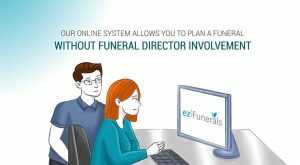 Our eziFunerals planning platform is confidential, secure and free. Peter Erceg, Owner and Founder of eziFunerals said “our SaaS system is simple and flexible. It’s up to the user whether to do comprehensive funeral plan or just connect with funeral directors online and get a Quick Quote. We want to empower consumers to take a more active role in the funeral arrangements, than they typically have done in the past. The ability to nominate a Funeral Guardian to take care of you final wishes. Connect with independent funeral homes Australia wide. Free funeral resources and guides. Create an Advanced Health Care plan. Private and secure storage of personal end of life records. Big savings on time and funeral costs. Select your planning module option and follow the steps provided in each section.